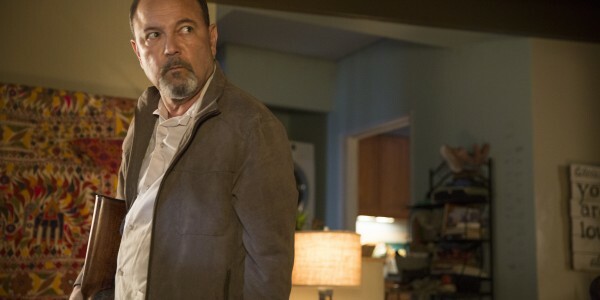 "Plot movement without much substance"
The interesting thing for me as I watch Fear the Walking Dead slog through the world-building process is how hit or miss the show can be in terms of setting mood and doling out crucial plot points. Granted, The Walking Dead often stumbles over both of these items while setting up the show's various safe havens, but it's equal parts humorous and frustrating to see Fear falling into similar pitfalls. An example from "Not Fade Away:" the show has utilized a minor time jump of anywhere from a few days to a few weeks. That was a smart move, as the story had already squeezed all the tension possible from the idea of being trapped in a house with nowhere else to go and no outside contact (once your characters are playing monopoly to pass the time, it's time to move the plot forward at a strong clip). However, "Not Fade Away" lacked any sort of strong narrative structure and squandered the forward momentum gained by jumping forward in time. I don't particularly care for Nick, so I don't particularly care that he's being taken to the shady hospital. I do care significantly more for Daniel Salazar and Liza, but as both aren't "sick," I'm not all that worried about their continued existence (and it will be nice to have Liza as our "inside man" at the mysterious hospital). Now, this hospital could be a legitimate hospital, complete with excellent care and the like, but knowing how hospitals tend to fare in The Walking Dead, I'm not holding my breath. 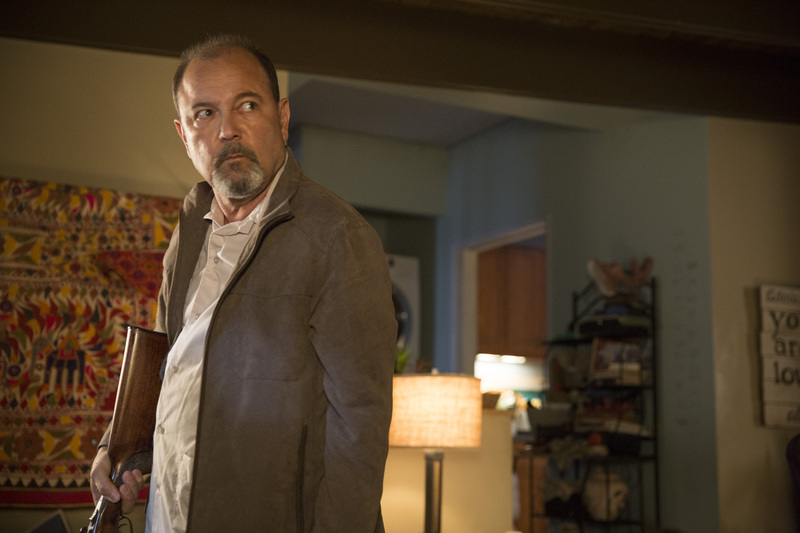 [caption id="attachment_74797" align="aligncenter" width="600"] Ruben Blades as Daniel Salazar - Fear The Walking Dead _ Season 1, Episode 3 - Photo Credit: Justina Mintz/AMC[/caption] So, on one hand, we have the show introducing a new location with some degree of unease in its shadowy set-up, and on the other we have the show separating its three most interesting and complex characters (Daniel, Liza, and Madison), which could backfire in a big way. Madison, our star, is now left in a house with Travis and the three most annoying characters on the series: Chris, Ofelia, and Alicia. Try leading a rescue mission with those four. On that note, it's time to talk about poor stupid Travis. Look, I've been trying to get on board with the character. I understand that he's rightly holding out some flame of hope that things will get better, and that he doesn't know what most of the audience knows- there is no hope, only pain and struggle. But every time he start spouting off about how things will get better, I want to smack him on the head. On the flip side, Madison appears to have fully committed to the Rick Grimes Future Apocalypse Leader training, risking it all to venture out into the world beyond the fence to see that, as I'm sure we all expected, the martial law outside the walls took out plenty of innocents in the name of purging the infected. The central theme in the Walking Dead franchise is that humans are the real ones to fear in this post-apocalyptic world, whether it be charismatic leaders with sinister intentions like The Governor, or a government that knows more than they say and is willing to manipulate the situation to their own wants and needs (which, from what we've seen of the Army man in charge, appears to be the way things are heading here). The existence of absolute power and control over a group of survivors never ends well on The Walking Dead, and I'm pretty sure that the same will occur on Fear the Walking Dead. The real question is when will Madison decide to rise up and abandon her home to protect her family from the Army and their rule? Considering her most likely ally, Daniel, (who really would be the best one of the entire cast of characters to have with you in case of a zombie apocalypse) is now off at the hospital, she lacks the support she needs while stuck with the show's most useless characters. [caption id="attachment_74796" align="aligncenter" width="600"] Kim Dickens as Madison, Cliff Curtis as Travis - Fear The Walking Dead _ Season 1, Episode 3 - Photo Credit: Justina Mintz/AMC[/caption] Final Thoughts: -- I had a brief moment where I thought Chris's video diary might really turn into something interesting. But then he started that cliched and ridiculous voice over, and I remembered why I can't stand his character. -- Now that the hospital and the mysterious light in the window are in play, I think it's safe to assume the crew will be setting out beyond the walls before the shortened season's end. -- Part of me hopes the hospital is, on the whole, a legitimate hospital with people trying to save others. But I really can't see that being the case. -- Considering Elizabeth Rodriguez (Liza) is doing double-duty with her role on Orange is the New Black, I wouldn't be surprised if Liza stays at the hospital and off screen for a while, assuming the show opts to keep the characters centrally located to Los Angeles for the foreseeable future.